Combine flax seed and water and set aside to soak. Combine zucchini and a pinch of salt in a large mesh strainer. Set aside and allow water to drain for about 5 minutes. Press slightly with a wooden spoon to release excess liquid. When zucchini has drained, combine in a large bowl with onions, garlic, and flax seed. Season with salt and pepper to taste. Heat a cast iron skillet iron skillet over high heat until hot, then reduce heat to medium-low. Spray pan with cooking spray. 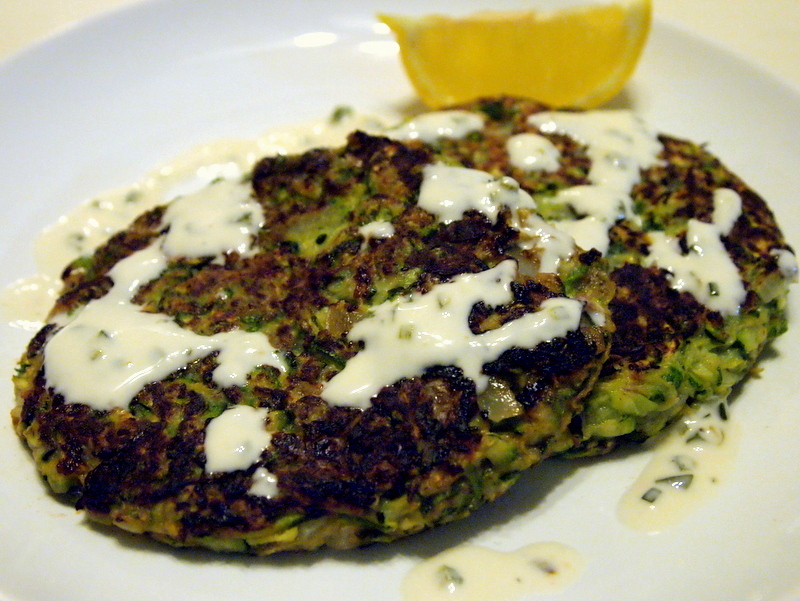 Form palm-sized patties from zucchini mixture and carefully place in skillet. Cook until lightly browned, about 5 minutes, then flip and continue cooking until the other side is browned. Continue cooking fritters, re-greasing the skillet between each fritter, until all the zucchini mixture is used. While the fritters are cooking combine the sauce ingredients in a small dish. Serve fritters warm, drizzled with sauce.